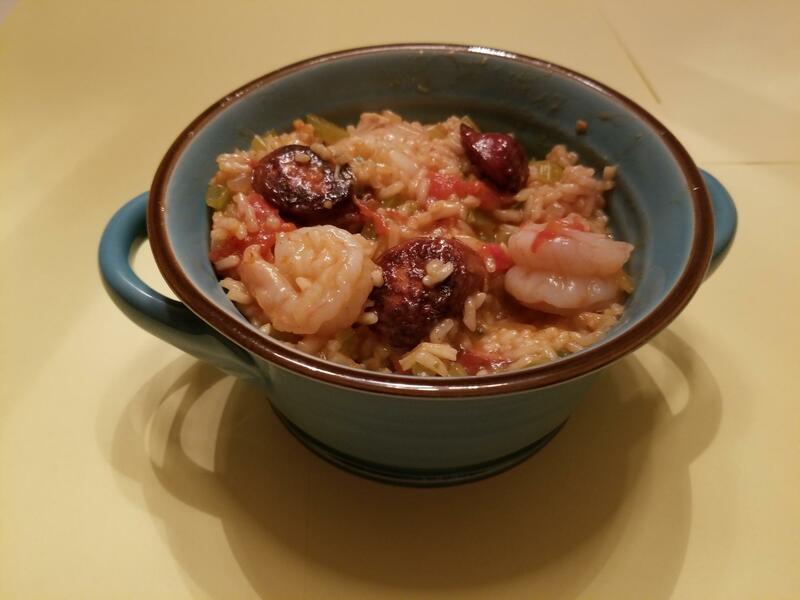 There are probably as many recipes written for jambalaya as there are for chili or pork ribs. The simple thing to realize is that you are not likely going to get an official 5-Star rating for this dish. What you want is something that is simple to make, tastes real good, and satisfies everyone's short term needs for a nice hot supper with plenty of zip. I first came upon this dish when the Super Bowl was held in New Orleans back in 2001 (SuperBowl XXXVI to be exact), and I have been off and on making it to coincide with this yearly event ever since. What's nice about this dish is that it has just the right balance of protein and carbos....every fork full has either sausage, chicken, or shrimp on it, along with whatever rice seems to tag along. One of the things I try to do with my recipes is to provide an ingredient's amount in how you would see it naturally. How many diced onions are in 2 cups? Life shouldn't be this hard; just give me 2 medium onions diced! Enjoy making the recipe, enjoy it's flavors, and enjoy it with a glass of unoaked Chardonnay. It makes for a perfect pairing. 1. Cut the sausage on a bias into 3/4" segments. Add just a little cooking oil to a 4" deep skillet and brown sausage over medium- high heat, stirring constantly for about 5 minutes. 2. Remove the sausage from the pan and then add the onions, celery, pepper, garlic, and herbs. Saute for about 5 minutes with medum heat, moving the mix constantly. Add a little water if necessary to prevent burning. 3. Add the tomatoes, broth, and rice to the vegetables. Stir to blend. When the fluids begin to boil, reduce heat to simmer for about 20 minutes. 4. Meanwhile, in a 350 degree pre-heated oven, cook the chicken until the internal temperature is 160 degrees (about 15 - 20 minutes) Remove from the oven and dice into 1" cubes. 5. When the rice is just short of being fully tender, drop in the chicken and shrimp and stir. Cook until the shrimp is pink. 6. Serve in bowls or however you want to present the dish. Don't be fussy! And of course, don't forget a glass of chilled Chardonnay.